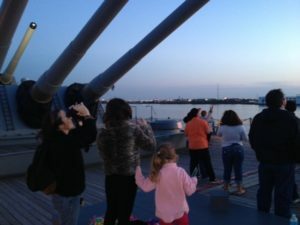 Guests can see the stars from the decks of the Battleship! You’ll also see planets and some satellites too! The Battleship will be one of the sites of The Philadelphia Science Festival’s Citywide Star Party on Friday, April 26 from 7:30pm to 9:30pm. See the stars, planets and satellites through telescopes on the forecastle (forward deck) of the Battleship during this free event. Parking on Clinton St. will also be free.